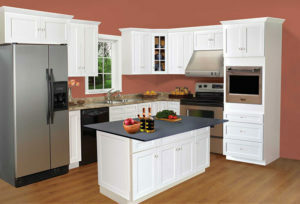 Kitchen cabinets seem like a simple thing at first, but the more you get to know as you get ready to place an order for new RTA cabinets, the more complex it may seem. Today we’re going to look at dovetail drawers; what are they, do you need them, and why do people ask for them? Dovetail construction is, in the simplest terms, a slot-and-tab method of joining two pieces of wood together. Rather than screwing or nailing, a dovetail joint involves no fasteners, other than some wood glue. Counterintuitively, this sounds bad, right? After all, if wood glue was enough, why would anyone ever use screws? Well, if you were just butting two pieces of wood up against each other, that would be true. But the slot of the dovetail provides a lot more surface area, and an overlap of the wood’s structural integrity on both sides of the joint, making it one of the strongest types of joints possible, since there are no screws to strip, or nails to loosen. If I Order Budget Kitchen Cabinets Without Dovetail Drawers, Are They Bad? Dovetail joints do tend to be more durable, because there are no screws to strip out. This is certainly a consideration when you’re ordering your RTA cabinets, but that doesn’t mean everything else is junk. The key factor here is cost; dovetail joints require a more skilled craftsman, and more time to make. It also “wastes” wood, since cutting away the slot in one side of the joint, and the flanges around the tab on the other, essentially cuts away the length of the dovetail tab and turns it into sawdust, meaning more raw materials go into making less finished product. This all adds up to increased cost of manufacturing, which then results in increased cost to you. Do I Need Dovetail Drawers? At RTA Cabinet Store, some of our cabinet models use dovetail drawer joints, while others don’t, depending on the price point intended as they’re designed. Whether or not you personally need them is something you’ll have to answer for yourself. Whether you order cabinets with or without dovetail drawers, our discount kitchen cabinets are a quality product that we stand behind proudly. So come on in, take a look at what we have to offer, and if you need, give us a call for a free professional kitchen design consultation to help you narrow down just what you need to make your dream kitchen come to life!